Wales fell one round short of emulating their 2011 semi-final achievement, losing to South Africa in last year's quarter-finals. Jones, 30, starts for Wales in their Six Nations opener against Ireland at the Aviva Stadium in Dublin on Sunday. "We know where we fell short [in the World Cup]," Jones said. "And I hope we can play a bit of positive rugby to put that right and score the tries that we essentially did not do enough." 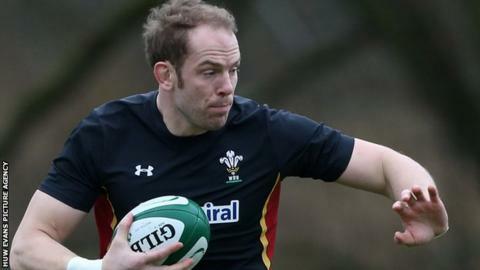 Ospreys' Jones, who will win his 95th Wales cap at the Aviva Stadium, believes Wales will benefit from their World Cup experience and says he is relishing the campaign. "It is an exciting place for Wales," Jones said. "There is a bit of change in certain areas, and that might not be a bad thing. "The guys who came in during the World Cup took an opportunity and did well. The change was forced, and it is not normal to blood players during a World Cup. We now have greater strength in depth, and that can only be good." Ireland will be without the now retired second-row Paul O'Connell, plus injured stars such as Tommy Bowe, Rob Kearney, Cian Healy, Sean O'Brien and Peter O'Mahony. "Ultimately, it is a difficult place to play, no matter who they have. We have experienced it a few times," Jones added. "I will miss locking horns with Paul O'Connell and both of us trying to win. You cannot shy away from the effective guy he was in his position. "But Devin Toner played alongside him for a long time and has been doing very well for Leinster."